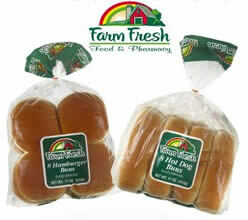 FREE 8ct Hamburger or Hot Dog Buns at Farm Fresh Supermarkets! FREE 8 ct. Farm Fresh Hamburger or Hot Dog Buns with coupon this weekend only! Click on the coupon to download or print and redeem at any Farm Fresh location Friday, 06/08/12 through Sunday, 06/10/12. One coupon per person please. Click here to see if there's a Farm Fresh near you. Click here for coupon.